From Goodreads: Yes, your baby’s perfect name is out there. The trick is finding it. The perfect baby name will speak to your heart, give your child a great start in life—and maybe even satisfy your relatives. But you can’t expect to just stumble on a name like that in an A to Z dictionary or on a trendy list. That’s why you need The Baby Name Wizard. Created by a name-searching mom, it uses groundbreaking research and computer generated models to pinpoint each name’s image, examine its usage and popularity over the last 100 years, and suggest other promising ideas. 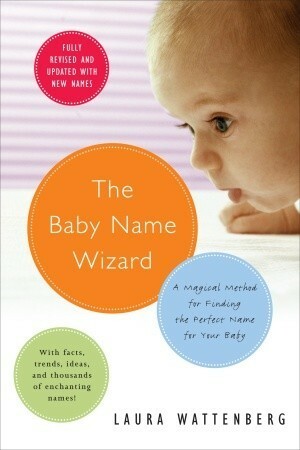 A perfect guide to the modern world of names, The Baby Name Wizard will engage you from the first name you look up and keep you enchanted through your journey to the just-right name for your baby. Looking for a warm, old-fashioned bibilical name? Male choices abound, but for girls’ names it’s slim pickings. Hannah is one that hits the bulls-eye. It’s simple and sweet and sounds great with almost any type of surname. Hugely popular, especially in cold-climate states where warmth is always in fashion. Wyatt is rawhide tough, but polished enough for the big city. One of the strongest and most versatile of the retro-cowboy names. There are more examples HERE. As well as the snapshots, The Baby Name Wizard is full of easy-to-read graphs and charts detailing when names were most popular and how they’ve trended over time. Plus, there are lists of names that share a certain feel (Country & Western, Biblical, Celtic, Lacy and Lissome, etc…). All in all, it’s an incredibly helpful resource (and, simply, an interesting book) especially if you’re struggling to come up with a character name that has a specific ring to it, or a name from a certain time period. Have you used The Baby Name Wizard? What are your favorite character naming resources? C is for Cummings, E.E. Ha! This is awesome! I use baby name sites when I’m stumped for character names, but I’ve never seen this one. Thanks for sharing, Katy! Gladly! It really is an awesome resource! I kind of love all the male names listed. I don’t know why, but I’m much pickier about female names, whereas, as you can see from my indiscriminate appreciation of the eleven male names on this page, I have a much easier time with them. This sounds like a much more detailed look at names than the usual ‘means X in Y language’ internet overviews. Funny, I’m much pickier about boy names than girl names. I find so many more likable girl names than boy… huh. And yes, BABY NAME WIZARD is definitely so much more than the meaning and alternate spellings. I love it! Dude, you have no idea how long I’ve been obsessed with the Baby Name Wizard. I assume you’ve seen the name voyager tool on the website? It’s ridiculously addictive. I bought the actual book when I was pregnant, and it’s helped name both my daughter and a number of my characters. So yes, I FREAKING LOVE this! Ooh, I’m intrigued by your 16th century France WiP, Elodie. Hope to hear more about it one of these days! No problem, Lynn. Hope you find it useful! That would have been a most excellent April Fools gag, Erin! I haven’t heard of the Seventh Sanctum, but I’ll definitely check it out. Thanks for the resource, Erin! That’s a great resource for babies and for characters (arguably another form of ‘babies’). I use all of the online sources, but it would be nice to have one to flip through. I’m one of those writer freaks who likes her characters’ names to have significance. I’ve only named a couple of characters with no thought to their name’s meaning. I guess I’m weird that way 😀 Thanks for sharing this resource! I like my character names to have significance too, Jaime, and I’m not opposed to spending weeks seeking out the perfect choice. Hope you check out the BABY NAME WIZARD. It’s awesome! Great idea for names! I usually use whatever pops into my head first! Love this resource, though! Hope it proves to be helpful, Kris! Ooh, yes! I kind of love Cass! Funny how subjective writing is, even down to the tiny details of character names. I’ve been a name nerd for years, and my style tends towards the classical eccentric and classical unusual (e.g., Felix, Wolfgang, Ezra, Octavia, Justine, Lysander, Leopold, Ianthe, Iolanthe, Aurelian, Oliver, Calandra, etc.). I generally only use a popular, common, or trendy name on a character if it’s a secondary or minor character. My favorite online resources are Behind the Name and Name Nerds. I also used to use Kabbalarians (before it switched to a paying site) and 20000 Names (before I found out a number of their so-called meanings aren’t exactly correct). Of course, for my non-American characters, I like to use names that aren’t so common in their respective homelands as well. I’ve never used a resource for naming characters–their names usually pop into my head. But maybe I *should* use a resource because I’ve noticed that I tend to use the same letters over and over again: lots of As and Js, for some reason. Even I’m sick of it! Oh, and one time I named a character the exact, uncommon name of my dad’s high-school girlfriend–whom I’d never heard of before. It was weird. Wow! I kind of love the ex-girlfriend story, Rebecca. 🙂 I sometimes find myself favoring letters and sounds too. For awhile, my MC Callie had an aunt named Mallory. Cal and Mal? No thank you! I visit the social security baby names website often when naming characters. I love that you can look up names based on birth year so it is helpful for naming historical characters as well as modern ones. But the suggested sibling names feature of baby name wizard makes me think I’m going to need to move beyond ssn. I’ve used the SS site before too, and you’re right: It’s great for searching names that fit a specific time period. The Baby Name Wizard has similar info, but in quick-reference charts. Isn’t it?! Like I mentioned: Sometimes I just grab mine and page through it for fun. You’ll be extra glad to have yours one of these days, Kari. It’s good for naming babies, characters, and even future pets! Ha! But if you buy it solely for naming characters, you’re golden! I still use my mom’s old baby name book for characters…and for laughing about some of the names popular in 1962 :-D. I’ve found some websites to use when I need a more updated source, but I’d prefer something in book form, especially when it comes time to look for names for my own children. Thanks for the recommendation!